Now while I do plan on giving Sky's food the ultimate praises, there are some things I want to give everyone a heads-up on before visiting. I've been here a few times, so I feel confident in giving an honest opinion about some noticeable recurring themes. One, service is a little questionable. Although everyone seems friendly, I've gotten a few exasperated responses when asking about vegan menu items. Also, getting your food takes forever. My longest wait time was 30 minutes, which I think is, frankly, unacceptable. I mean, it takes at least 10 minutes just to get your drinks. Two, although there is a vegan menu, it's not without its faults. Sky's is fond of the "vegan tax," meaning anything that can be made vegan will cost you extra: extra for vegan cheese, extra for vegan sour cream, extra for vegan meat. So your bill may come out to a little higher than originally expected upon first glance at the menu. Servers also don't seem to mention that these items come at an extra charge, and you won't find out until you see your receipt. That being said, every time I've come here, they've been out of vegan items. Whether it's "no vegan meat until 3pm," "we're almost out of vegan cheese, so there's only enough for your first item," or "we're out of vegan sour cream," it's always SOMETHING. I'd suggest you maybe call ahead if you're planning a trip here, lest you be disappointed in the end. This was my first ever taste of Sky's. I figured I'd start out small, seeing what they could do. And let me just say, they blew my mind. A simple taco in a double corn tortilla, with chunks of vegan meat, lettuce, tomato, cilantro, and what tasted like Daiya cheddar. It's also topped with Sky's Sassy Sauce, which is a sweet and smoky tomato salsa. The meat is spicy and so well seasoned, it's literally bursting with flavor. A definite must-order menu item for Sky's first timers. 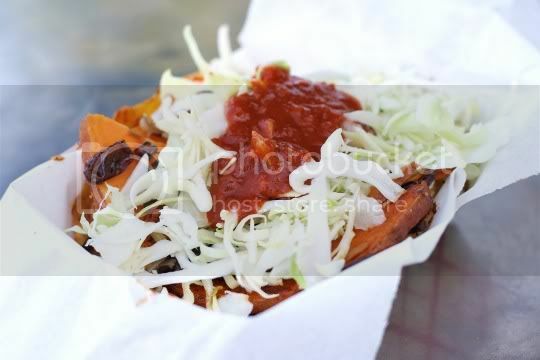 But perhaps even more surprising was the potato taco. 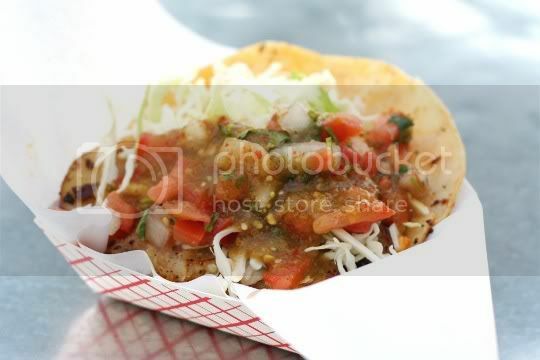 I was expecting crispy fried potato pieces in a taco similar to the one above, but instead the potatoes were roasted and combined with shredded cabbage, tangy salsa verde, and fresh pico de gallo. 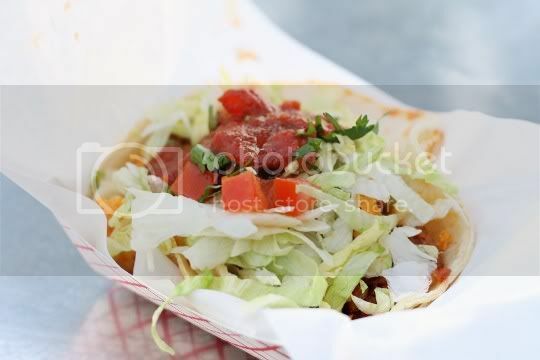 I'm not sure if it's the potatoes or the salsa, but something in this taco is very spicy (but in a good way). Like the vegan meat, the potatoes are loaded with flavor. 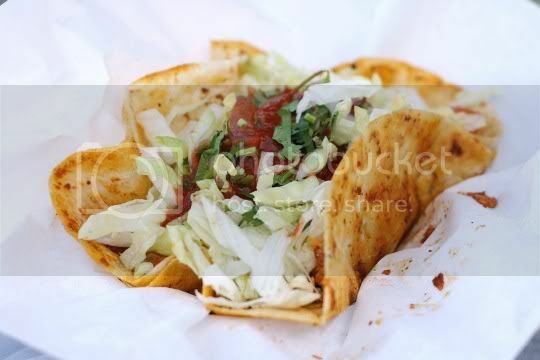 The tortillas are fried just enough to make them a little crispy and chewy, making this an absolutely delicious taco. The taco is pretty massive for the tortilla size, so you'll likely need to eat some of the filling before you can actually pick this up and grab it. Another must-order item. And maybe even MORE surprising was this strange melange of ingredients: toasted almonds, wild rice, thinly sliced and sauteed yams, and raisins, all in a double corn tortilla with shredded cabbage and that delicious sweet sassy sauce. Trust me, it works. Although some of the yam pieces were a little undercooked (this making them hard and chewy), they were probably some of the sweetest yams I've ever tasted...and not via seasoning. Whose amazing idea was this?! When this arrived at my table, I was pretty sure they'd given me the wrong order. A burrito at Sky's is basically a HUGE soft taco, super hearty and filling, with a flour tortilla lightly fried until it's thick and chewy. (I ordered this with vegan sour cream, but they were out of it; I think it would have added a nice touch, but the burrito was still amazing without it.) The texture of the tofu reminded me of tofu that's been frozen and thawed, chewy and a little rubbery, but ready to soak up all kinds of seasonings and flavors. It's extremely well seasoned, with emphasis on the cumin and a bitter pepper flavor, probably ancho chile. It's pungent and salty, and causes your burrito to drip with orange greasy liquid (hey, it's true Mexican comfort food). There's also loads of lettuce, Daiya cheddar, and sassy sauce. You'll need to eat some of the filling out before you can pick this up, since it's super massive. The tofu causes the burrito to get a bit soggy at the bottom, but it won't even faze you as you try to get every last bite. I'll be honest...it's the bread that makes this sandwich so amazing. Not to take away from any other parts of it: the seasoned soy meat chunks, the Daiya cheddar, the lettuce, tomatoes, onions, and cilantro. But the bread is perfect. Pillow soft, yet hearty enough to hold all of its fillings, and grilled and seasoned on the outside. Whatever seasoning is used is a bit salty, but every bite is a dive into true Mexican comfort food. The sandwich is greasy, hearty, and filling. 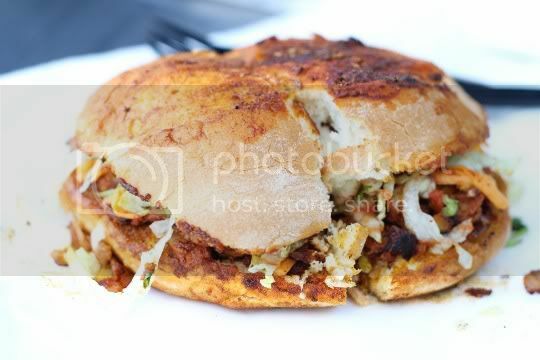 Try it with additional avocado for a true Mexican torta experience. I couldn't even finish the whole thing, but the leftovers held up well and made for a nice snack the next day. Oh Sky's, why did you have to run out of vegan cheese (and vegan sour cream) for my nachos. 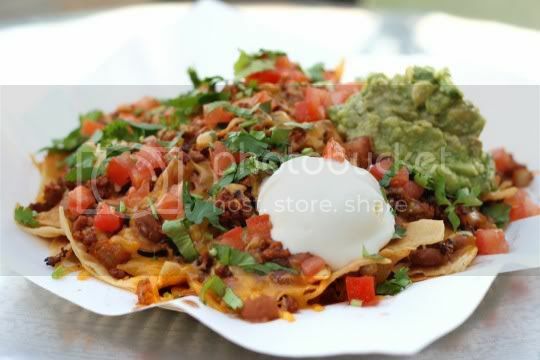 Yes, those are regular dairy items you're looking at in the photo, but either way, these nachos are stellar. Seasoned crumbled vegan meat, pinto beans (or black, if you prefer), cilantro, tomatoes, and tasty guacamole complete this massive meal that two or three people could easily split. Each chip is well covered in each ingredient, and while the price for these may seem steep, believe me when I say you're getting a ton of food. As a fellow diner told me, "This might be some of the best lemonade I've ever tasted." For something as simple as lemonade, that's saying quite a lot! Sky's lemonade is almost cloyingly sweet, but still tangy, tart, and full of fresh lemon flavor. It's a little thick and syrupy, so it's best to let the ice melt a little before you really enjoy this. 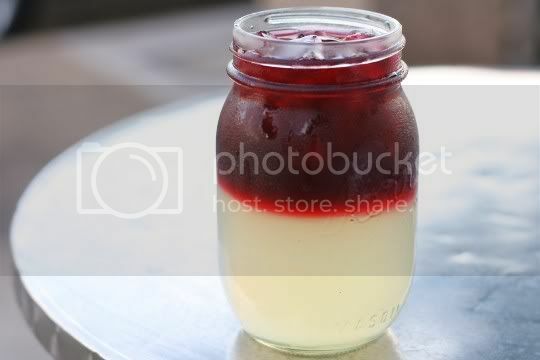 The sorrel layer on top adds a slightly carbonated, herbal, sangria-like flavor to the already delicious and refreshing lemonade. It adds extra sweetness, so stick with the regular version (10 cents cheaper) if you want more of a traditional taste. Although I do think the sorell version is delicious, I'd personally stick with the plain lemonade because it is just too good to drink with anything else. Forget ordering water, soda, or anything else...get the lemonade when you come to Sky's! 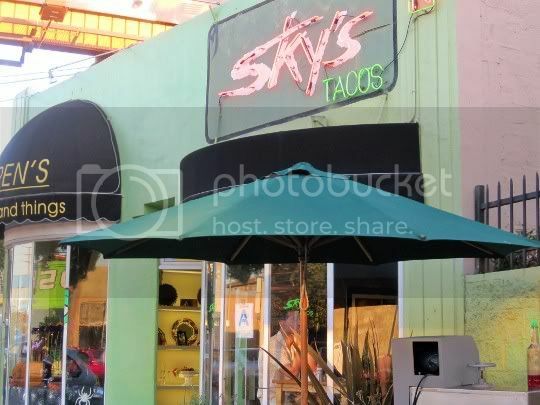 I'm so happy that a place like Sky's Tacos exists, not to mention that it's only a couple miles from my house, where I can get some of the best veggie Mexican food in LA. Although the place isn't perfect, the food is, and that's good enough to keep me coming back (and recommending it to anyone who asks!). And get this, they even have a food truck! Sky's Tacos for all! This place sounds AMAZING!!!! I HAVE to go...Oh....And I'll be getting that LEMONADE!!! !